Time to cut out the sliding deadman. By now some of these steps should be pretty familiar. 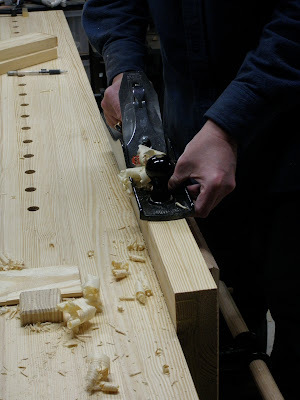 Before going further, I planed the piece down to final thickness. 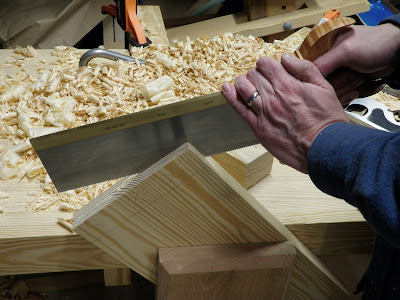 Since I had to take off about 1/4" from each face, I tried three different planes: my transitional jack with crowned blade, a metal fore plane with slightly more aggressive crowning, and my scrub plane, with the most aggressive blade (meaning the smallest radius to the crown). Then I jointed and smoothed both faces. 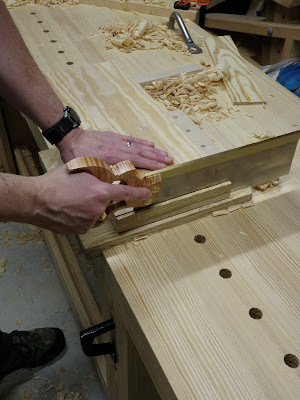 After having used the transitional for heavy work before, I was surprised and pleased to find the thicker blade in the metal fore plane made faster work of it. I measured the thick shavings with a dial caliper at about 30 thousandths. The scrub made about the same progress, but with deeper, narrower cuts. This is definitely a useful experiment to try with your various planes to see which one works most efficiently for you. Trimming to length. This needs to be a precise cut, although I still took a hair off the endgrain with the jointer. 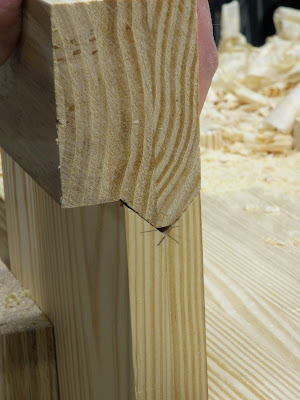 Forming the V-groove in the bottom edge. 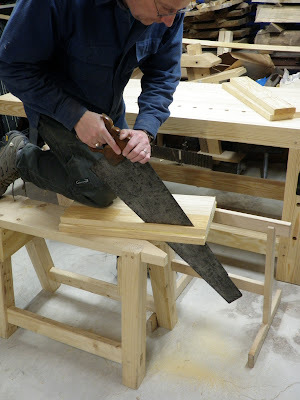 First I cut down the center line with a tenon saw, then started cleanout with the chisel. 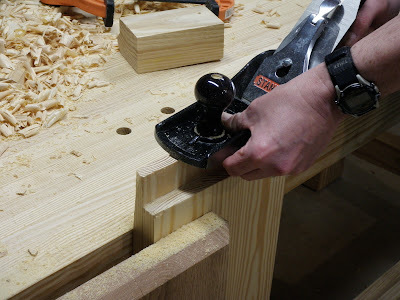 I finished up with the shoulder plane, alternating from side to side. 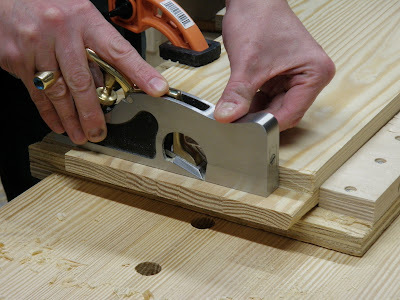 Using a cutoff from the bottom rail as a reverse mullet to check the fit of the groove. Cutting the half-lap tongue that will fit in the top track. A little further shaving of the top edge until it slid into the top track and dropped down on the rail. The deadman slides smoothly back and forth along the length of the rail. Next will be final shaping. Nice work! 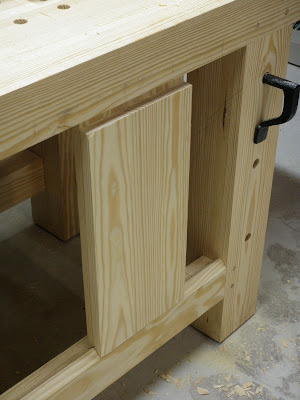 I just finished my sliding leg vise recently and I am kicking myself for not using a shoulder plane to clean up the v groove on the bottom. 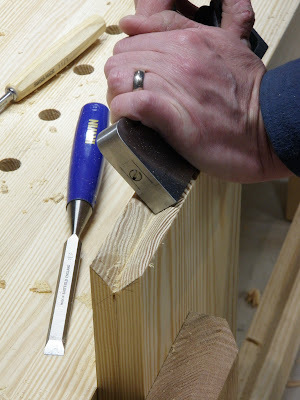 I ended up using a chisel and a rasp and the shoulder plane would have been much quicker. Thanks for the tip for the next time I need a v groove.